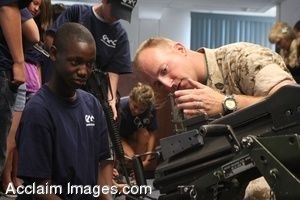 Description: Clip art photograph of a military recruiter showing a weapon to a teen. The weapon appears to be a machine gun or mounted weapon. Clipart photograph by Department of Defense Public Domain.